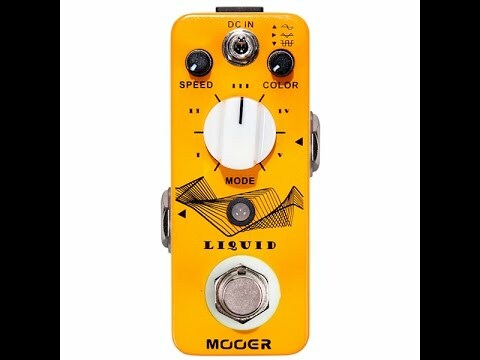 The MOOER "Liquid" is a pocket sized Digital Phase pedal crammed full of cool features. The large control knob allows you to choose from 5 very different Phasers which range from subtle vintage phase to outright wacky and extreme modulation. After selecting which type of Phase you want to use, navigate swiftly to the three position switch to choose which wave form suits the sound you're after. Round, triangular or square. Manipulating the speed control will adjust the rate of modulation and adjusting the color control will modify the tonality of the effect which really lets you get your sound dialed in.